Everyone knows that exercise is good for you. Your body and long-term health will thank you for it and you will feel more positive and energized. Physical activity can lower your risk for heart disease and improve your health in many ways. No news there….hopefully. 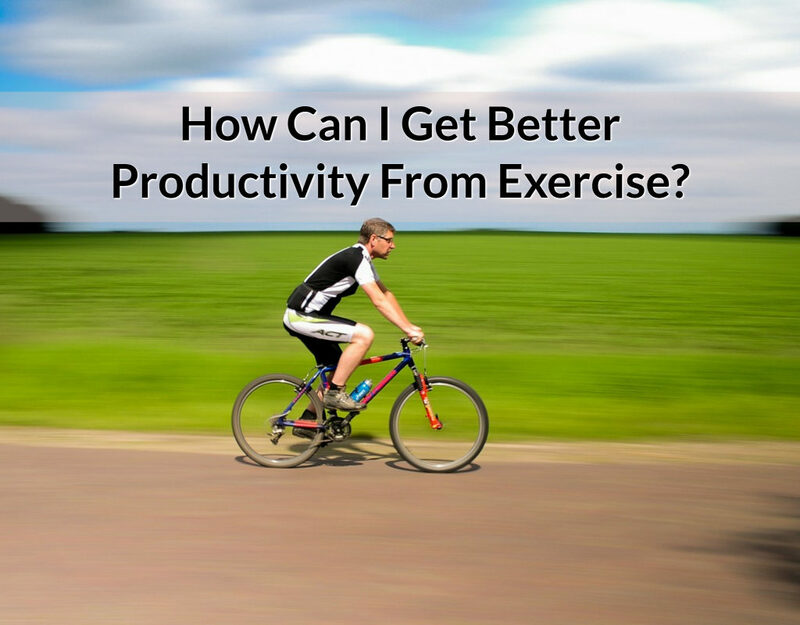 But how does exercising affect your productivity? And how can you be more productive in your training? I’d like to look at the way exercising and productivity can impact each other positively to bring you results. Keep reading to learn how to integrate training into your productivity framework. Does Exercising Really Make You More Productive? I’m not bringing up academic reasons about the benefits of regular exercise. If you’re interested in the details or getting into Biohacking I encourage you, not sarcastically, to do some searches more related to that..it’s a rabbit hole and please report back on what you find! What I am talking about is your business and your overall long-term goals – Is training going to help? The main perk, in my opinion, is that moving your body lowers your stress levels. Besides improving your mental health, not feeling overwhelmed is good for business. If you don’t feel like you are constantly putting out fires, you will be able to concentrate better and have a more positive outlook on your responsibilities. Truth be told, even though I exercise regularly, I’m feeling the stress levels creep up as I’m writing this since it was a day behind and I had wanted to have the afternoon free. So it goes – but I’m making the choice to finish it up and then step outside and go for a walk. I know the end results will be better than ignoring the task OR completing it and continuing to work on other details or tasks that pop up. Speaking of points of view, doing something you enjoy will help your brain process information. By getting distracted and doing something else, you will give your mind time to develop a fresh perspective. You will be surprised by the number of ideas you can come up with when you are not even trying. If you haven’t tried going for a walk part way through the day to stimulate some creative thinking, you’re missing out! What Productivity Principles Can I Apply to Training? For many people, exercising turns into a daunting task in itself. One more goal that we don’t have the time to accomplish. So how do we make sure to incorporate exercise into our routine? Prioritization is everything, especially when it comes to productivity & training. We tend to push training off because it is not as important as meeting our 90-day or yearly targets. But is that really the case? If you think of how important your health is in the long run, you will realize that exercise needs to be bumped up the list. Experiment with your schedule. It may turn out that you really love running at night. Or if you are like many, the later you push the gym, the less likely you are to go. Try moving it first thing in the morning and see if you become more consistent. Give yourself more time than needed. A 30 minutes jog doesn’t take just half an hour. Consider getting ready, getting to wherever you start your run if you don’t just walk out the door, showering and other potential delays. The more realistic you are with your time the less likely you are to stay healthy. Set reasonable goals. Going from zero exercise to running a marathon in a couple weeks may not be the best idea. Don’t expect to spend 2 hours in the gym every day straight away. Take it one step at a time and enjoy the journey.You’ll feel better and be MUCH more likely to stick with it for the long term.